I was tucking my son into bed, as I always do last night. If I'm being completely honest, my mind was on all the things I had to do before bed. I'm a busy full time working mom, along with being a lifestyle blogger and freelance writer. Usually when I lay in bed at night, I'm emailing, working on social media, writing, or researching. My 3 year old was not in the mood to sleep and kept going over to his window. "Mason, get back in bed please," I pleaded. He pulled back the curtain and said "Mama, look at the moon!" I was suddenly aware of how long it had been since I really looked at the sky. I used to sit outside and stare at the stars all the time, but over the years I kind of forgot about doing it. I put my phone down and we stared at the moon together. It was a big full moon, with clouds hovering around it. "Lets go there!" he said. I asked him how we were going to get there, and he said we would take a big blue dragon. He looked at me and excitedly said "hop in, mama! ", then he made some kind of dragon sound and we flew to the moon together. We flew to the moon a few times before he finally agreed to be tucked into bed. I always take time to play with him, but for some reason flying to the moon made me really appreciate his imagination and how precious this age really is. I'm making a vow to myself to be more present, and to take more time for fun little adventures with him going forward. Have you ever had a moment that reminded you to be more present? Tell me about it below! This is so sweet! Love it! 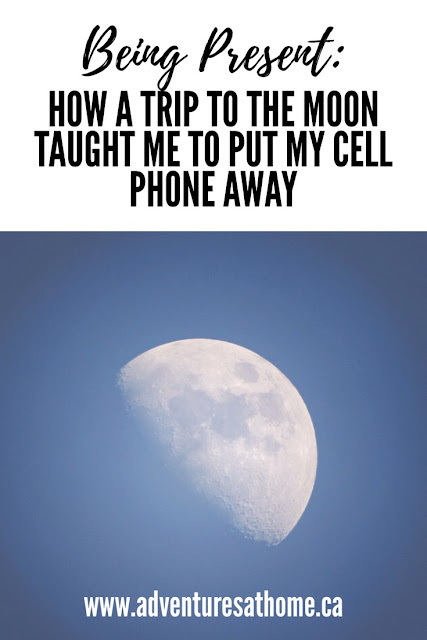 We usually sing out moon song once a week. Just today my 5 year old was asking what was being built at the construction site. I responded to her that it was probably just some more apartment buildings ( we live in a college town so they pop up a lot). She then exclaimed "Maybe it's a castle!!!" So sweet and then we talked about who would live in said castle. I'll miss this innocence when she gets older. I'm in this constant battle to be more present in my children life. I feel the tug, the swat of the phone and the plea for attention but struggle with mind-numbingness of it all. That's why I try to get outside and get to mom group because these spaces force me to put my phone down. I love this! We all need to take a trip to the moon once in awhile. Great reminder! I love this! I often need reminders to be present, as I also have lots on my mind. I love your little one's imagination! This brought a tear to my eye. Thanks for the sweet story and important reminder to be present!